And just like that, without ceremony or any real sense of fanfare, the career of one of this generation’s better fighters had ended. In a sense, Kessler’s announcement, and the manner in which it was made, wasn’t terribly surprising. He hadn’t engaged in a professional bout since suffering a competitive-but-clear decision loss at the hands of rival Carl “Cobra” Froch in May 2013; and had previously been inactive for periods of up to a year due to injuries suffered in the ring. This information, taken in conjunction with the fact that, at almost thirty six years of age, he was probably past his physical peak as a competitor, means that retirement from the ring was likely to happen sooner rather than later. Nor should the unassuming manner in which Kessler retired come as too much of a shock. For when he was active, he almost never engaged in the type of pre-fight bombast and hyperbole that’s become all too common in the sport these days. Instead, he conducted himself with quiet confidence, and came across as a fighter who was content to wait until he stepped inside the ring to convey any message he wished to send to his opponent. And, usually, when all was said and done, “The Viking Warrior” was able to ensure that his opponent had received the message in a manner that would be remembered for quite some time. Operating behind a high guard that allowed him to deflect most of his foe’s incoming, and a stiff accurate jab that kept them off balance, Mikkel would advance into range, and then proceed to unleash combinations of precise, powerful punches at their body and head. If the opportunity presented itself, he could end a fight with a single punch thrown from either hand (e.g. his decimation of then WBC titleholder Markus Beyer with a straight right, and his near-decapitation of Allen Green with a perfect left hook); failing that, he was perfectly capable of issuing sustained abuse over the course of the full twelve rounds. And, if an opponent was able to survive this assault and return fire well enough to pierce his defence, Kessler was capable of absorbing the punishment and carrying on with the matter at hand. Really, the only true flaw in Kessler’s game was the fact that his approach, while certainly effective, was perhaps a bit predictable and one-paced. In the three losses that he suffered in his career, Kessler’s opponents were capable of figuring out his rhythm, and were able to disrupt it through the use of greater work-rate (as Froch did in their rematch), greater manoeuvrability (used by Andre Ward when he defeated Kessler in 2009), or a combination of the two (which allowed Joe Calazghe to overcome his counterpart during their 2007 unification clash). Still, it should be noted that Calzaghe is now in the International Boxing Hall of Fame, and that Ward and Froch have both become fixtures in pound-for-pound rankings in recent years. So, it’s fair to say that only the elite were capable of defeating Kessler. The rest of the opponents he faced, no matter how good, were dealt with in decisive fashion. So, now that Kessler’s career has concluded, the question now becomes: How should he be remembered? Did he do enough in his career to follow Calzaghe into the Hall of Fame? Well, the numbers themselves are pretty impressive. Kessler’s final record was outstanding, 46 victories (with 35 knock-outs) against only three defeats; and, as we’ve already established, the three fighters who defeated him are proven competitors in their own right. Kessler won versions of the world super-middleweight championship on four separate occasions, and made six defences in total of the world titles he held throughout the course of his career. It should also be noted that many of his fights were waged against a decent calibre of opponent; no less than eleven of his opponents were past or future world titleholders, and his record against them was a more than respectable 8-3 (6 KO’s). On the other hand, Kessler’s record against elite calibre opponents is only 1-3, with the sole victory coming against a then-undefeated Froch in 2010. While he was competitive, at least to some extent, in all three of his defeats, it could certainly be argued that he served as a sort of Gatekeeper to the Elite. And, throughout history, fighters who have served in that capacity often aren’t recognized by the Hall of Fame in their lifetime. 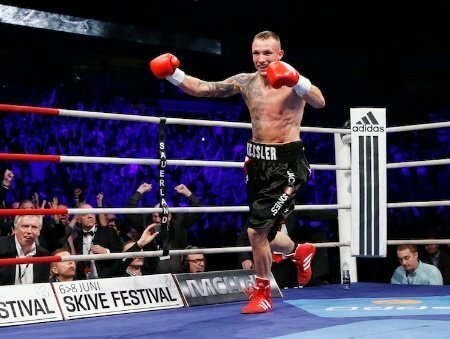 So, it’s not certain whether Mikkel Kessler will receive an invitation to fly to Canastota, New York to accept induction into the Hall in the next few years. Given the quality of fighter who has been enshrined in recent years, it could be argued that the Viking Warrior wouldn’t look at all out of place- but voting members might take a different view, especially considering his losing record against the very best fighters he faced in his career. Either way, I feel that the careers of fighters like Kessler should be celebrated once all is said and done. For, he was a proud champion who was willing to travel to enemy territory to take on the best available opposition. Win or lose, he provided fans with some memorable, exciting contests; and for that alone, he deserves to be remembered fondly. In centuries past, Kessler’s ancestors believed that, upon drawing their final breath, their greatest warriors might be allowed entry into a realm where their deeds and valour would be celebrated throughout eternity. Given the manner in which the Dane conducted himself in battle, I’m quite certain that the Norse gods would happily grant him immediate entry into their most hallowed hall when the time is right. …And,that’s the highest honour that any Viking Warrior could hope to achieve.